Considerable cloudiness. Occasional rain showers after midnight. Low around 45F. Winds W at 5 to 10 mph. Chance of rain 40%.. Considerable cloudiness. Occasional rain showers after midnight. Low around 45F. Winds W at 5 to 10 mph. Chance of rain 40%. 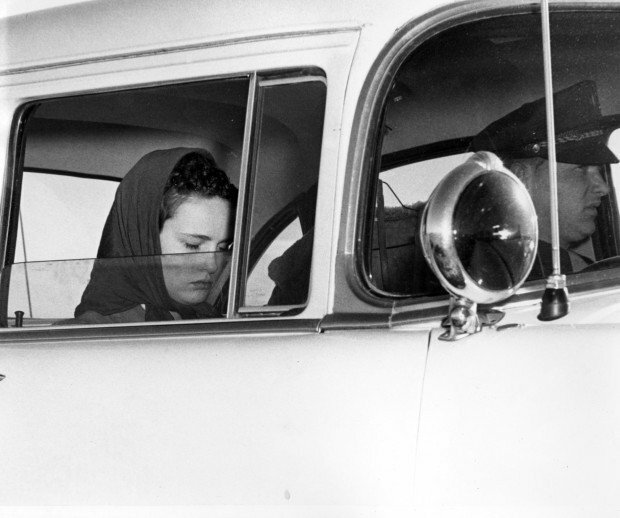 Caril Ann Fugate waits for medical treatment for her shock at the Converse County Sheriff's Office on Jan. 29, 1958. Caril Fugate is seen with a police officer on Jan. 29, 1958. Caril Ann Fugate in the Converse County Sheriff’s Office on Jan. 29, 1958. Converse County sheriff’s deputy Bill Romer escorts Caril Ann Fugate into the Converse County Sheriff’s Office on Jan. 29, 1958. Romer carries a rifle confiscated after the arrest of Charles Starkweather. Converse County Deputy Sheriff Bill Romer inspects a shotgun as Sheriff Earl Heflin and Caril Ann Fugate look on Jan. 29, 1958. 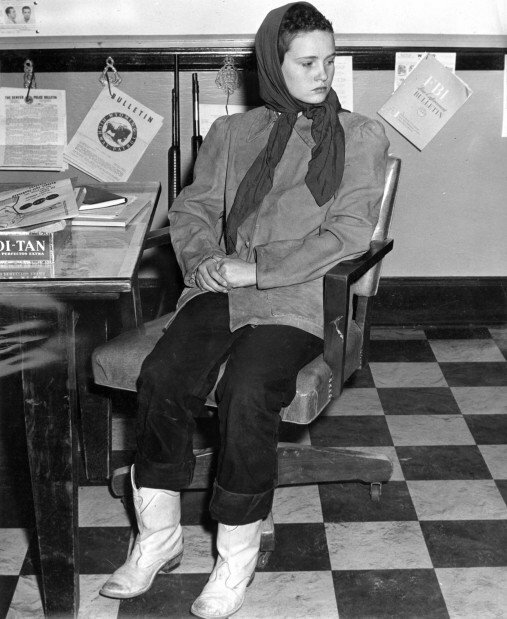 Caril Ann Fugate waits in the Converse County Sheriff’s Office on Jan. 29, 1958. Nebraska National Guard troops guard a Lincoln Bank with machine guns on Jan. 29, 1958, the day Charles Starkweather and Caril Ann Fugate were arrested near Douglas. Investigators guard and examine the car Charles Starkweather was driving on Jan. 27, 1958, the day he and Caril Ann Fugate killed three people and got stuck in the mud near Bennet, Neb. A bullet hole in seen in the vehicle Charles Starkweather was driving when he was apprehended near Douglas on Jan. 29, 1958. A woman who was one of two teenage participants in a 1957-58 killing spree that left 10 people dead and ended with the duo’s arrest near Douglas has been critically injured in a crash, western Michigan authorities said Tuesday. Caril Ann Fugate was 14 and spree participant Charles Starkweather’s girlfriend when she was arrested following the killings that began in Lincoln, Neb., and became the basis of the movie “Badlands” starring Sissy Spacek and Martin Sheen and inspired the song “Nebraska” by Bruce Springsteen. Fugate, now 70, now goes by the name Caril Ann Clair. She had since married, relocated to Stryker, Ohio, and continues to maintain her innocence, as she has since her first-degree murder conviction in 1958 for the robbery and killing of a 17-year-old from Bennet, Neb. Monday night’s crash near Kalamazoo, Mich., killed Fugate’s 81-year-old husband. Frederick A. Clair was driving north on Interstate 69 when the couple’s SUV went off the road and overturned, the local sheriff’s department said. Starkweather, who was spotted eating at a Lusk cafe after news of the murders in Nebraska were broadcast by the media, killed a Montana salesman on U.S. Highway 20-26 between Lusk and Douglas before being apprehended outside Douglas by a Casper geologist and two local law enforcement officials on Jan. 29, 1958. Starkweather was 19 at the time. Fugate’s role has been debated for decades: Was she a murderous accomplice to Starkweather, whose killings in 1957 and 1958 included Fugate’s mother, stepfather and baby sister on Belmont Avenue in Lincoln? Starkweather’s family maintained that justice was served unevenly, with his father often saying Fugate should have been “sitting on Charlie’s lap” when he was executed in 1959. Or was Fugate a frightened teen, yet another victim of Starkweather? Fugate — at the time the youngest female to be convicted of first-degree murder — was originally sentenced to life in prison. She served 18 years before her sentence was commuted to 30 to 50 years. She moved to Michigan after she was paroled in 1976. One man’s trash is another man’s treasure. And sometimes it might just rewrite history. The top 10 stories and galleries at trib.com from the past week.